Figure 1. 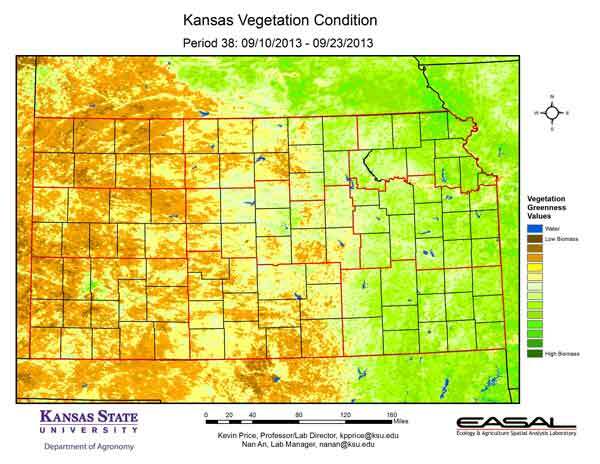 The Vegetation Condition Report for Kansas for September 10 – 23 from K-State’s Ecology and Agriculture Spatial Analysis Laboratory shows that the areas of reduced photosynthetic activity continue to push eastward. Much of the vegetation in western Kansas is going into dormancy, and winter wheat emergence is still limited. Latest reports from Kansas Agricultural Statistics indicate emergence at 3 percent, which is close to the 5-year average. Figure 2. 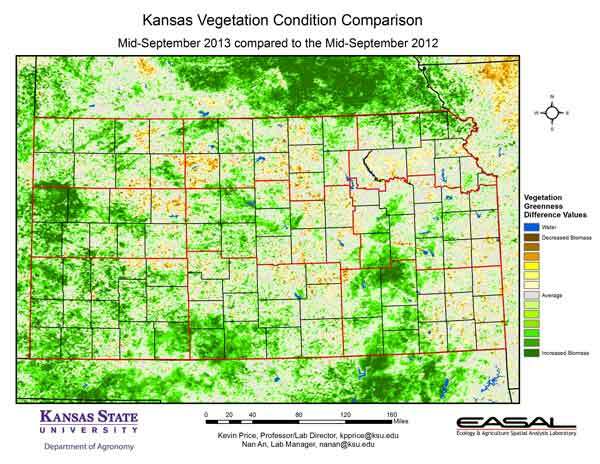 Compared to the previous year at this time for Kansas, the current Vegetation Condition Report for September 10 – 23 from K-State’s Ecology and Agriculture Spatial Analysis Laboratory shows that vegetative production continues to be much higher. The combination of greater rainfall and more favorable temperatures this year have increased plant productivity. Wallace County has reported almost double the precipitation for the current year-to-date compared to last year. Summer temperatures (Jun-Aug) are averaging more than 2 degrees cooler than last year. Figure 3. 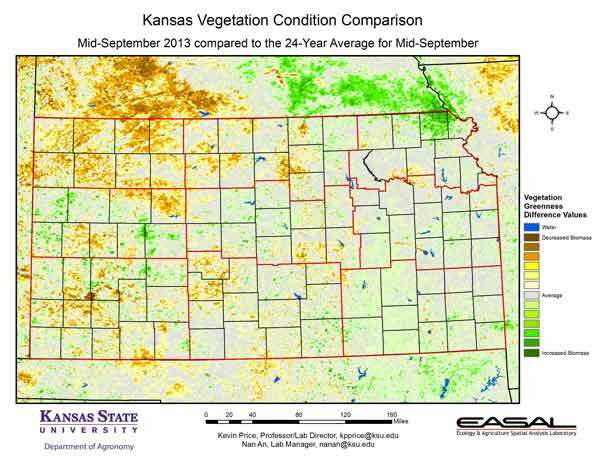 Compared to the 24-year average at this time for Kansas, this year’s Vegetation Condition Report for September 10 – 23 from K-State’s Ecology and Agriculture Spatial Analysis Laboratory shows that the greatest area of below-average biomass production is concentrated in the northwest. This division was the latest to see significant moisture this season, and also has had the warmest temperatures for the month. Norton Dam has the current high temperature for the month of 107 degrees F.
Figure 4. 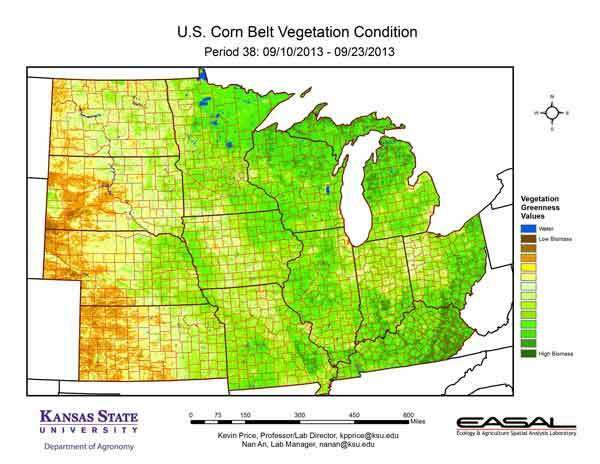 The Vegetation Condition Report for the Corn Belt for September 10 – 23 from K-State’s Ecology and Agriculture Spatial Analysis Laboratory shows that the greatest biomass production is in the eastern portions of the region. Eastern Kentucky has particularly high NDVI values. Rainfall for that state is running above average, and 65 percent of the pastures are reported in good to excellent condition. Figure 5. 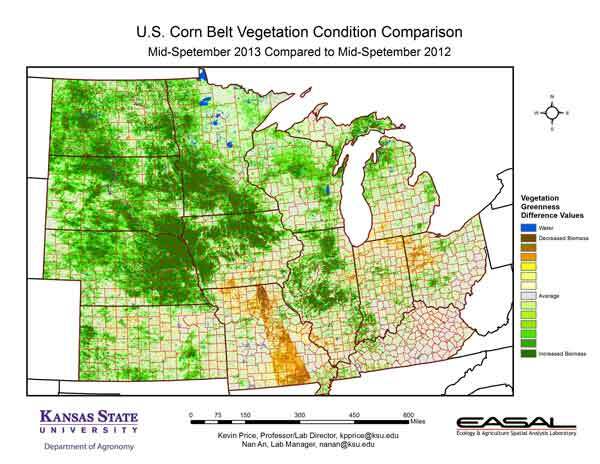 The comparison to last year in the Corn Belt for the period September 10 – 23 from K-State’s Ecology and Agriculture Spatial Analysis Laboratory shows that the northern and western parts of the region have much higher photosynthetic activity. This is particularly evident in eastern Nebraska. There is a very sharp triangle of lower NDVI values in Missouri. This is a result of cloud contamination in the satellite imagery. Figure 6. 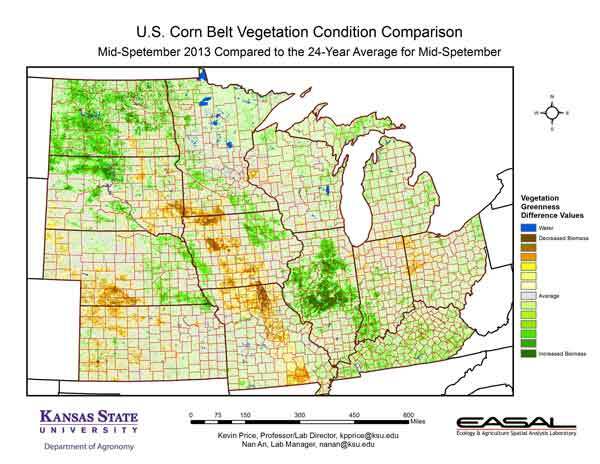 Compared to the 24-year average at this time for the Corn Belt, this year’s Vegetation Condition Report for September 10 – 23 from K-State’s Ecology and Agriculture Spatial Analysis Laboratory shows that North Dakota and central Illinois have the biggest increases in photosynthetic activity. For both of these areas, delays in crop development are the major factors. In Illinois, for example, only 5 percent of the corn has been harvested compared to a 5-year average of 24 percent. In North Dakota, soybean harvest was at 3 percent, behind the average of 12 percent. Cloud contamination in the satellite imagery continues to be visible in central Missouri. Figure 7. 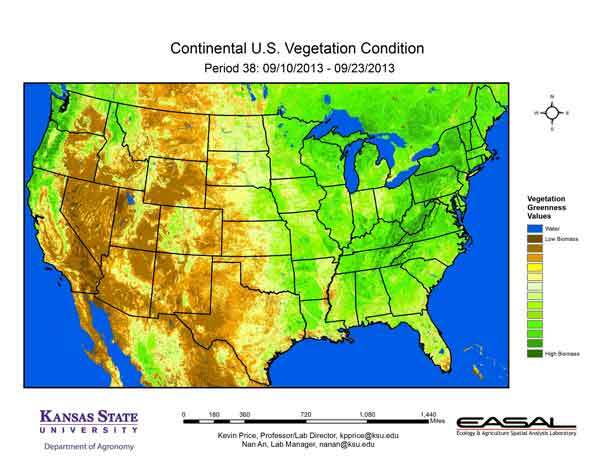 The Vegetation Condition Report for the U.S. for September 10 – 23 from K-State’s Ecology and Agriculture Spatial Analysis Laboratory shows that the highest NDVI values are from the central Appalachians to New England. A second area of high biomass production is also visible in the Pacific Northwest through northern Idaho. Some delays in hay harvest were reported in Idaho due to the rains. Figure 8. The U.S. comparison to last year at this time for the period September 10 – 23 from K-State’s Ecology and Agriculture Spatial Analysis Laboratory shows that the Northern Plains continues to rebound from the extreme drought of last year. The cloud contamination in the satellite imagery in Missouri extends through Mississippi. Figure 9. 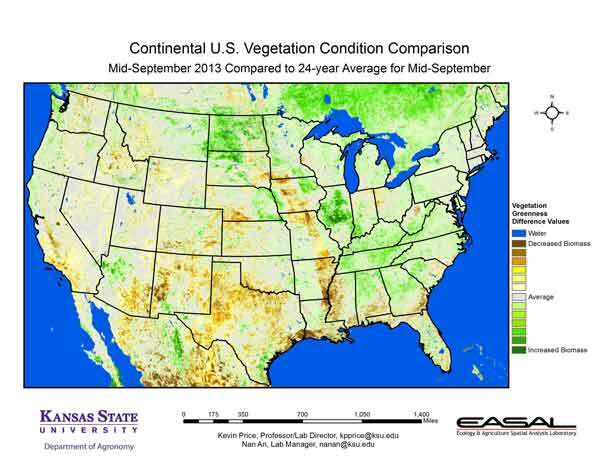 The U.S. comparison to the 24-year average for the period September 10 – 23 from K-State’s Ecology and Agriculture Spatial Analysis Laboratory shows that much of the continental U.S. has near-average biomass production. North Dakota and central Illinois are spots of above-average values, due to delays in crop progress. Northern Texas and parts of the western High Plains continue to lag in biomass production due to continued drought. Also low biomass values are visible in parts of the Gulf Coast where heavier rainfall has been noted.